New Age pseudoscience is always based on some kind of religious or occult viewpoint. Where New Age pseudoscience typically is based on the claim that science has to integrated with occult and religious viewpoints, then the pseudoscience of reductionism typically is based on that science has to be integrated with (or is the same as) atheistic and/or political viewpoints. (see my article The pseudoscience of reductionism and the problem of mind). Personally I am supporting true skepticism within science, but my method is not itself building on science, but on philosophy. I consider myself as a philosophical investigator, who is using critical thinking, and not a scientific investigator, who have to follow the precepts of conventional scientific skepticism. This is due to, that I have experienced spiritual crises and paranormal phenomena (therefore I can´ t be an agnostic), but at the same time I am critical towards how to describe and behave in relation to such phenomena. a) Assertion of scientific claims that are vague rather than precise, and that lack specific measurements. b) Use of obscurantist language, and use of apparently technical jargon in an effort to give claims the superficial trappings of science. a) Assertions that do not allow the logical possibility that they can be shown to be false by observation or physical experiment. b) Over-reliance on testimonial, anecdotal evidence, or personal experience. This evidence may be useful for the context of discovery but should not be used in the context of justification (e.g. statistical hypothesis testing). c) Presentation of data that seems to support its claims while suppressing or refusing to consider data that conflicts with its claims. This is an example of selection bias, a distortion of evidence or data that arises from the way that the data are collected. It is sometimes referred to as the selection effect. d) Reversed burden of proof. In science, the burden of proof rests on those making a claim, not on the critic. 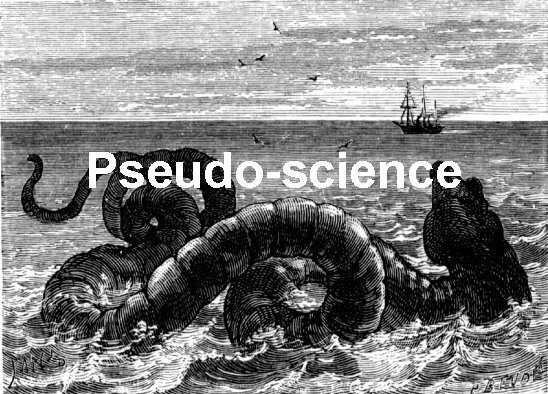 “Pseudoscientifical” arguments may neglect this principle and demand that skeptics demonstrate beyond a reasonable doubt that a claim (e.g. an assertion regarding the efficacy of a novel therapeutic technique) is false. It is essentially impossible to prove a universal negative, so this tactic incorrectly places the burden of proof on the skeptic rather than the claimant. Evasion of peer review before publicizing results (called “science by press conference”). Some proponents of theories that contradict accepted scientific theories avoid subjecting their ideas to peer review, sometimes on the grounds that peer review is biased towards established paradigms, and sometimes on the grounds that assertions cannot be evaluated adequately using standard scientific methods. By remaining insulated from the peer review process, these proponents forgo the opportunity of corrective feedback from informed colleagues. a) Failure to progress towards additional evidence of its claims. Terence Hines has identified astrology as a subject that has changed very little in the past two millennia. b) Lack of self correction: scientific programmes make mistakes, but they tend to eliminate these errors over time. By contrast, theories may be accused of being pseudoscientific because they have remained unaltered despite contradictory evidence. c) Statistical significance of supporting experimental results does not improve over time and are usually close to the cutoff for statistical significance. Normally, experimental techniques improve or the experiments are repeated and this gives ever stronger evidence. If statistical significance does not improve, this typically shows that the experiments have just been repeated until a success occurs due to chance variations. a) Tight social groups and authoritarian personality, suppression of dissent, and groupthink can enhance the adoption of beliefs that have no rational basis. In attempting to confirm their beliefs, the group tends to identify their critics as enemies. b) Assertion of claims of a conspiracy on the part of the scientific community to suppress the results. c) Attacking the motives or character of anyone who questions the claims. a) Creating scientific-sounding terms in order to add weight to claims and persuade non-experts to believe statements that may be false or meaningless. b) Using established terms in idionsyncratic ways, thereby demonstrating unfamilarity with mainstream work in the discipline.